Unreal Lawns supply and install artificial grass in Stalybridge and the north west of England. We serve domestic and commercial customers in the area, with products suitable for a wide range of applications from outdoor spaces and gardens, to event areas, exhibition space and more. See below for some examples of projects we've carried out in the Stalybridge area. 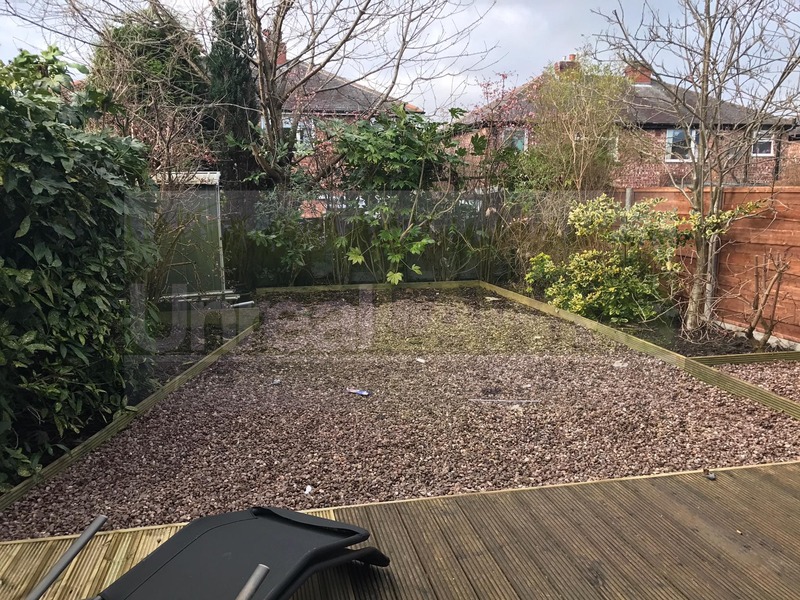 The owners of this garden in Stalybridge were getting tired of the dog digging up the garden and bringing mud through the house. It was leaving the lawn looking very patchy and worn. 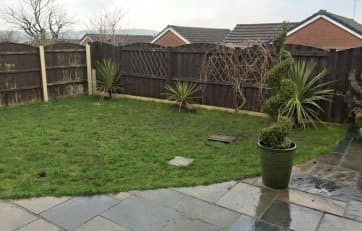 They were thrilled with the result after our artificial grass installation, and can now let the dog run around in the pet friendly garden without the stress of muddy paws. 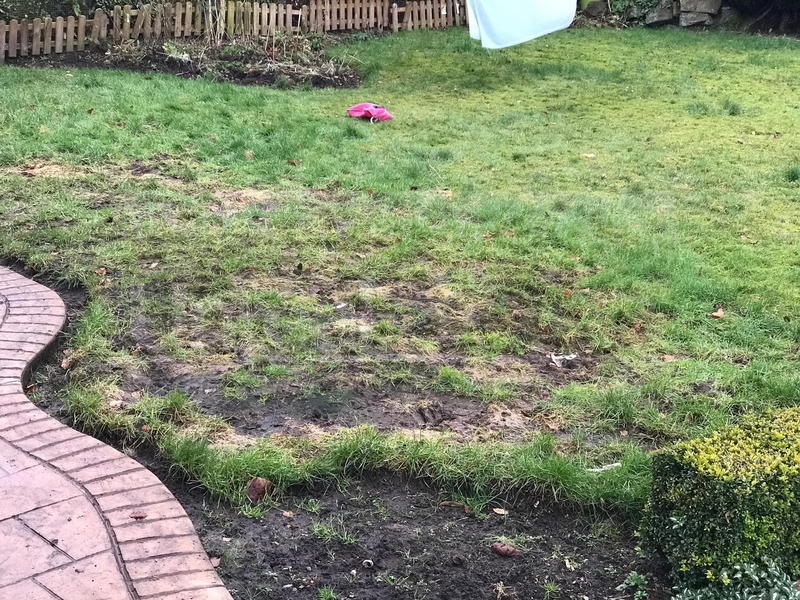 Unreal Lawns were contacted by a customer in Stalybridge whose lawn had become muddy and worn out due to the dog running around on it. Unreal Lawns visited a homeowner in Stalybridge who wanted to add some colour to their garden using our artificial grass. The previous garden had no lawn, and was made up of gravelled areas and decking. We installed our Supreme 40mm artificial grass to create a nice green space that didn’t require the maintenance involved in keeping a real grass lawn. Unreal Lawns were contacted a family in Stalybridge who wanted their trampoline to sit flush at grass level. 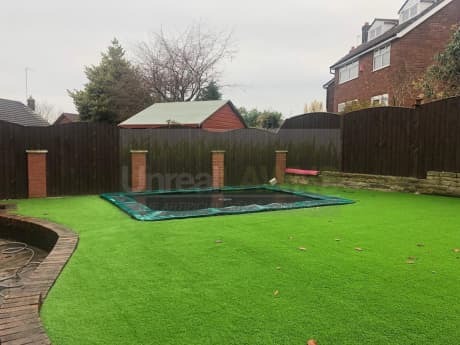 Our professional installers used their expertise to prepare the area to ensure rainfall wouldn’t collect beneath the sunken trampoline while ensuring a neat and tidy finish around its edges. Artificial grass is a great addition to any garden with children as it provides a soft surface for them to run around and play upon. Contact the Unreal Lawns team today to find out how we can transform your garden.